Every region has a few dishes that involves just rustling up some basic stuff together to get by on a lazy or difficult day. These dishes are never made for guests as they are considered too simple, minimalistic, and not grand enough to be served to guests. Palakkad has it’s own set of such dishes – Chembu thandu curry, moloshyam / molagoottal, vattikkal, pachadis, and the list goes on. Mulaku varutha puli is one such and a family favorite. On days when amma makes this, we run out of steamed rice because everyone tends to overeat. 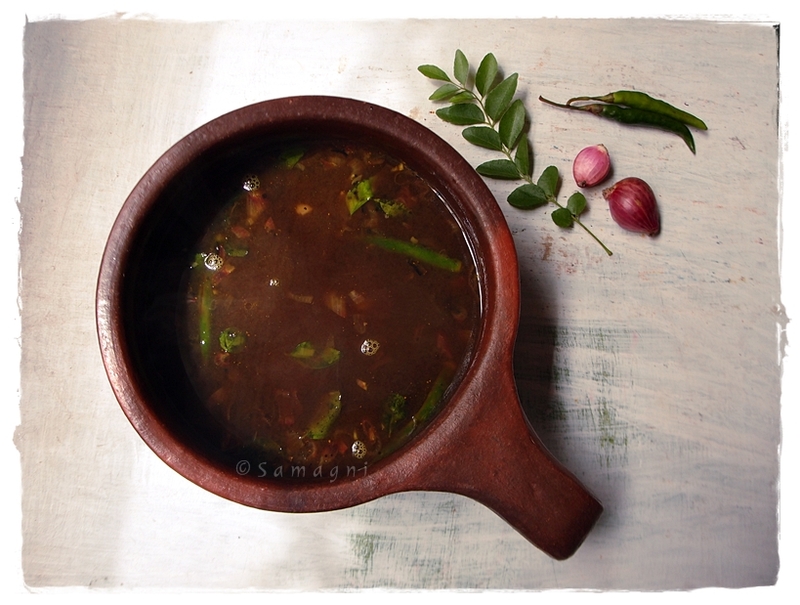 It is nothing but some chilies and shallots cooked in diluted tamarind water. The title sounds very grand like the accented Mulligatawny soup coined by Britishers. It is actually quite similar to a clear sour soup. So here is how. Soak the tamarind in warm water and extract the juice. Discard the pulp. Keep the tamarind water aside. Slit the green chilies. Peel the shallots and chop finely. Keep aside. In a wok, add oil and mustard seeds. When mustard seeds splutter, add slit green chilies, finely chopped shallots, and curry leaves. Saute the chilies and shallots in oil for about 2 mins. Add the diluted tamarind water into the fried green chilies and shallots. Add salt as needed and bring to boil. Taste and adjust the amount of water and salt. Sour and tasty mulaku varutha puli is ready to be served with steamed hot rice. Notes: It is important to add jaggery as it balances the tart of the tamarind and gives it a wonderful taste without making the dish sweet. A chammanthi/chutney (not to be confused with chutneys served with dosa) that can add punch to the most mundane item like a rice gruel (kanji) meal. Mouth-watering, lip-smacking, flavorful, tangy; all these adjectives cannot do justice to this chutney. Make this once, and you will be addicted forever. 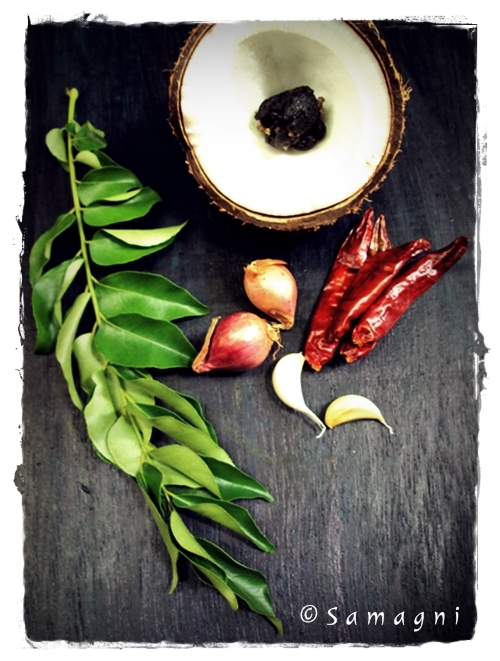 Traditionally this chutney is made by roasting whole coconut and dry red chilies over burning charcoal. I can only imagine how exotic and flavorful this version must be! Heat an iron pan and dry roast the grated coconut and red chilies in medium heat. Turn off when the coconut turns to golden color. Transfer to a plate and let the coconut and chilies cool down a bit. Peel shallots and garlic. Clean the tamarind by removing seeds and stringy membranes, if any. Grind all the ingredients in a mixer. I used a traditional stone grinder (ammikallu). Use very little water while grinding to make a coarse chutney. Serve with warm rice or rice gruel. This chutney can be used even for dosa or idly. I made a version without garlic and onion, and that too tasted extremely good. This line from a Malayalam poem loosely translates to “Goodness abounds in the village.” Life in the village is so much about sharing. Produces from your garden, special items made in the kitchen, sweets and savories that relatives bring, everything is shared with neighbors. Commonly cultivated backyard vegetables like drumstick, drumstick leaves, mango, jackfruit, all these items are shared with neighbors. Colocasia is one such plant/vegetable that neighbors share. Pictured here is a very sweet and super-efficient Saraswathi chechi, a great lady. One of her many roles include being a domestic help to my mother and many other families in our neighborhood. All special items such as banana stem, drumsticks, colocasia stem, tender jackfruit, raw mango, pass hands through Saraswathi chechi and a portion reaches all households in the vicinity. I would say that the colocasia plant is highly underrated. All parts of the colocasia plant – leaves, stem, and bulb can be used for cooking. Not all varieties are edible. Some that grow in wilder areas are to be avoided, I hear. Gujarati cuisine has colocasia leaf rolls called Paatra. The Mangalore region also has recipes using the leaf. I am not sure if any cuisine apart from Kerala uses colocasia stem. At home, we make 3-4 different varieties of dishes using colocasia stem and the leaf. Thaal (colocasia stem) avial is a dish that I learned from a neighbor while I stayed in Kochi. The best part about learning a recipe from someone is that you can never forget them even after many years. The first time you tasted that dish and how it smelled then lingers in your mind forever. Along with that the people involved with that memory stay on too. There have been many requests for this recipe. Due to lack of availability of ingredients, I have had to wait long before I could make the dish and click photographs. I was super excited yesterday when I finally got to make the dish after waiting for several years; all thanks to Saraswathi chechi. Wash all the vegetables. Peel the skin from colocasia stem. Remove the edges from long beans. Peel raw papaya and raw banana. Cut all the vegetables into one-inch long pieces. Keep the raw banana pieces separately. Add 1/4 tsp turmeric powder to a bowl of water and put the raw banana pieces in this bowl of water. Keep aside. The colocasia stem pieces seem like a lot but it shrinks to 1/4th size when cooked. Soak tamarind in 4-5 tbsp of water and keep aside. Put all the vegetables except raw banana in a thick-bottomed vessel. Add 1/4 tsp turmeric powder, red chili powder, and salt. Add 1/2 cup water to the vegetables, close the lid, and maintain medium fire. Stir occasionally and cook for 5 mins. When the vegetables start looking pale and getting cooked, add the raw banana pieces. Stir well and close and cook for another five minutes. Extract tamarind juice from soaked tamarind. Add to the vegetables being cooked. Mix well. Meanwhile, grind the grated coconut, shallot, and jeera to a coarse paste without adding much of water. When the vegetables are well-cooked and the salt and tamarind extract has been absorbed into the vegetables, mix the ground coconut paste with the vegetables. Cook for two minutes. Add curry leaves. Turn off. Add coconut oil and mix well. Enjoy the wafting aroma when you mix fresh curry leaves with the hot vegetables and coconut oil. Serve hot along with rice. Moms never cease to surprise! Just when you think you have tasted almost everything that your mom makes, there comes a new one. How I wish culinary skills were hereditary! So, the latest one that mom surprised me with is a coriander chutney powder. This spicy chutney powder is made with lentil and fresh herbs. It is easy to make and totally irresistible. Asafetida – 1 tsp, if powder; about one-inch piece, if using whole asafetida. Clean coriander leaves and curry leaves using water and wipe dry with a towel. Remove curry leaves from stalk and keep aside. Chop coriander and keep aside. In a thick bottomed pan, dry roast urad dal until it turns light brown. If you are using asafetida powder, add it to the urad dal just before you remove the urad dal from fire and lightly roast. Remove from the pan and keep aside. Add the red chilies to the pan and dry roast until the raw smell is lost and the red chilies start turning black. Ensure that flame is in ‘low’ because chillies can get burnt easily. If you are adding whole asafetida, dry roast it until it swells and starts giving out flavor. Remove from pan and keep aside. In the same pan, add the curry leaves. Dry roast until the curry leaves start turning crisp but retain the green color. Before you start grinding the ingredients, ensure that the mixer jar is completely dry. Add the roasted urad dal, asafetida, and dry red chilies to the mixer jar and grind until the ingredients turn into a coarse powder. At this stage, add the curry leaves and grind again. When the curry leaves are also ground, add fresh (but dry) coriander into the jar and grind again until all the green leaves are powdered well. Add salt and tamarind and grind again until all the ingredients are ground and mixed well. Remove from the jar. Adjust the salt to taste. Freshly ground chutney powder might be a little moist because of the use of fresh coriander leaves. You could even make tiny balls out of the ground powder or store it in powder form. Transfer the ground chutney powder into clean, dry jar. Refrigerate and use. This will last up to a month. This chutney powder can come to your rescue on a lazy day when you are too lazy to make an elaborate meal. Just make rice and serve this chutney powder with warm rice, ghee, and papad. You will not miss sambhar or any other subzi! You can try this chutney powder with idli/dosa also. Here is a tangy variety of poha that almost tastes like puliyodarai. I tasted this at a friend’s house and soon after tasting the first spoon, me and my mother were after my friend and her mother-in-law to get the recipe secret out. I tried making it soon enough so that I don’t forget the ingredients. Dry roasted and powdered whole masala ingredients are used for this recipe. Store this powder in an air tight container and then making this tangy poha is just a matter of few minutes. Let’s look at how tangy poha is made. Soak tamarind in half a glass of water and extract the juice. Choose the amount of tamarind very carefully. If you feel later that it is not sufficient, you can add lime juice to balance the taste. Grind the poha in a mixer to make a coarse powder (slightly bigger than rawa consistency). Transfer to a large bowl and keep aside. Mix the tamarind juice along with water and salt to moisten the poha. Use water carefully because the poha should just be sufficiently moistened. The consistency should be moist powdery but neither lumpy nor dry. Add jaggery powder. Mix well. Jaggery helps balance the tanginess and enhances the taste. Keep aside for 10 minutes. Since I used matta rice variety of beaten flakes, I could not get a fine powdery version. The white rice variety helps you get a nice powdery version. If you are using whole masala ingredients, dry roast each ingredient separately and powder them. I used powders except for fenugreek and jeera. Dry roast fenugreek and jeera in an iron kadai. Powder the roasted ingredients using a mortar and pestle before it cools down. Dry roast the remaining ingredients (coriander powder, black pepper powder, chilly powder, asafetida) together in the iron kadai in low flame for about 2 minutes until the raw smell is gone. Add the powdered fenugreek and jeera to this roasted masala and mix well. In an iron kadai, pour oil and crackle mustard seeds. If you prefer to add urad dal and chana dal, you can add them now. When the dals turn red, add curry leaves and peanuts. Roast for a minute. Add the masala powder along with turmeric powder and stir for half a minute. Add the powdered poha. Stir and cook for about two minutes. Add coriander leaves. Tangy poha is ready. An extremely easy alternative is to use ready-made Puliyodarai mix for this recipe. Coarsely grind the rice flakes using a mixer. Add sufficient salt and water to this coarsely ground powder and moisten the powdered rice flakes. In a kadai, heat oil and crackle mustard seeds. Add sufficient puliyodarai paste to this oil and mix well. Cook for a minute. Add the moistened rice flakes powder to this. Mix well and serve.